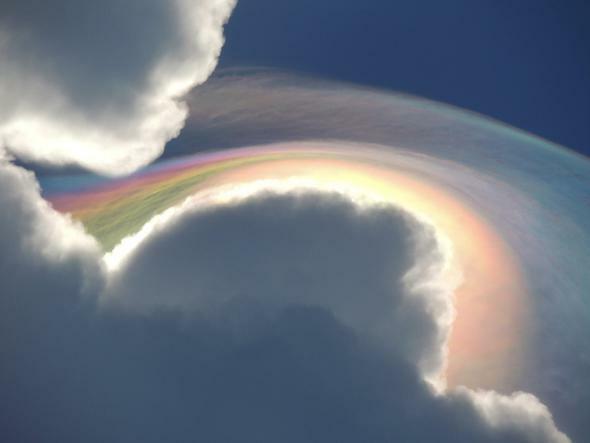 Iridescent pileus: Amazing photo of a twisted rainbow cloud. An iridescent pileus cloud. I love the perspective on this, looking almost straight up into it. Regular readers know how much I love a) clouds, and 2) optical phenomena in the sky, so I can say with complete honesty that this is by far the coolest pileus cloud with iridescence you’ll see all day. Right. You’ll probably want some details. This photo was taken by Beckie Bone Dunning on Oct. 29, 2015, when she was in Jamaica. There were storm clouds approaching, almost covering the Sun, when she snapped this shot. Being the huge dork that I am, I knew right away what was here. Note that the colors in iridescence are different than the ones in rainbows because they’re generated in a different way; you can get teal, pink, and more from iridescence. So that explains the colors. What about the weird, twisty shape? Ah, that’s because this isn’t just a cloud, it’s a pileus cloud. These are thin, cap-shaped sheets of cloud that form above rapidly rising columns of air. For example, in a cumulonimbus cloud, the shaft you see is due to the warm air rising, which usually bubbles into that cauliflower-shape head at the top. If there is a humid layer of air above it, the rising air will push it up (like a fist pushing through a rubber sheet), where it expands and cools. If it cools below the dew point, droplets form, and you get a pileus cloud. Pileus clouds are thin and have tiny water droplets in them. Perfect to make iridescence! You have to be at the right spot to see them, when the clouds are near the Sun … which is exactly where Dunning was. Voilà. Amazing. I’d LOVE to see something like this. I’ve seen both pileus and iridescence before, but never at the same time. I’d expect it’s rare where I live; we tend to get cumulonimbus clouds forming to our east, as air rises over the Rockies and picks up moisture as it crosses the plains. That happens in the afternoon, when the Sun is to the west, so they happen in opposite spots in the sky. Ah well. But that arrangement does supply us with a lot of rainbows, so I can be pretty happy with that, too. Double Rainbow … With Lightning! Tip o’ the nebular hat to Jacob Black.